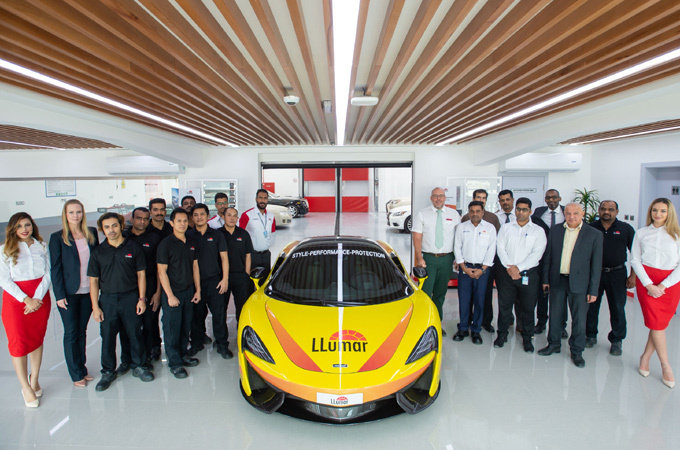 Ebrahim K Kanoo, a diversified business conglomerate, has inaugurated the first dedicated LLumar showroom and facility in Bahrain offering the latest window film solutions for automotive and architectural applications. It’s also the largest Llumar facility in the GCC. Spread over 2,000 sq ft, the new standalone facility in the Tubli region has a ground floor with an automotive showroom and workshop, and a mezzanine floor for the architectural team and a customer waiting area, Katie Peterkova, brand manager for LLumar, told Abdulaziz Khattak of Gulf Construction magazine. The facility is adjacent to Toyota Plaza and just behind the Toyota Plaza Petrol Station. It can service 10 cars of any brand at a time. LLumar, a brand of the US-based Eastman Chemical Company, has been partners with Ebrahim K Kanoo since 2006 and has since seen exponential growth in the market. The LLumar product portfolio includes a complete line of automotive window tint, paint protection films, commercial and residential architectural window films, safety/security and decorative films. Peterkova said LLumar films can boost the green credentials of buildings and thus enable them to achieve Leadership in Energy and Environmental Design (Leed) certification, which provides a framework to create healthy, highly efficient, and cost-saving green buildings. With LLumar products - which are backed by a market-leading manufacturer’s warranty - customers can earn up to nine Leed points, helping to design sustainable projects. The buildings get a more uniform appearance and a rapid return on investment. “With Llumar films, customers can see a reduction in air-conditioning cost (over 30 per cent) and hence a reduction in energy cost with potential payback of less than three years,” said Peterkova. Another advantage of using Llumar films is its anti-graffiti, anti-vandalism, and anti-glare (over 90 per cent) features. The film helps modify glass to safe breakage in conformity with EN12600. For aesthetics, Llumar offers consistent and appealing design of facades and large glass surfaces. In addition to automotive films, Llumar also offers interior and exterior detailing services including Platinum pro-ceramic paint protection (nano-ceramic). He said the window film market across the globe is very competitive and Bahrain is no different.